UN-Truth is a news /analysis-with-attitude site. Marian Houk is a veteran freelance journalist, presently based in Jerusalem, a past President (1986) of the United Nations Correspondents Association (UNCA) at UNHQ/NY, and a Member of the Online News Association. The first items were posted on UN Truth on UN Day [24 October] in 2006. when Marian Houk was still in Geneva. UN Day commemorates the UN Charter’s entry into force on 24 October 1945. The UN Charter was signed a few months earlier, on 26 June 1945, in San Francisco, in the wake of the Second World War. This was of course not an official UN website, and all opinions are purely personal. We started out hoping to shed some light on the workings of the United Nations and on issues that are discussed at the United Nations that are of particular concern to us. Human rights is one of those issues. Journalism – and freedom of expression, opinion, and movement – is another. Since May 2007, this blog has become more focused on the Israeli-Palestinian conflict [one of the main issues on the UN’s agenda since its foundation, also one of the main issues on the agenda of the UN’s predecessor, the Geneva-based League of Nations]. UN-Truth is hosted on servers that are set up and maintained by Zero-Analog in Seattle. In the photos below, taken in the UN Radio Studios in the Palais des Nations in Geneva, Marian Houk is shown conducting a UN Radio interview. Photos by Jean-Marc Ferre. 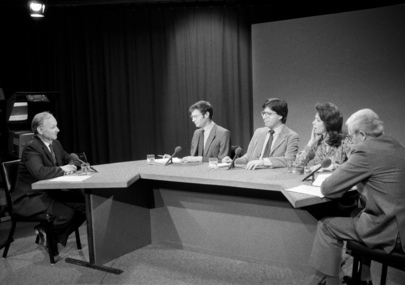 In the United Nations photo below, Maurice Strong, Executive Coordinator, United Nations Office for Emergency Operations in Africa, was interviewed on 5 March 1985 for the World Chronicle [a UN Television program] by a panel of journalists: (counter clockwise) Michael Littlejohns (Reuters), moderator; Marian Houk (Al-Bayan, Dubai); David Newell (New York Times); and Robin Dilks (British Broadcasting Corporation. And, click on the following link for a picture included in Liberian journalist Gabriel William’s book, Liberia: the heart of darkness: on this page. Thanks! The credit goes to Yousef at Zero-Analog. My name is Angulo Fu, from China. My blog is China Business Daily, the URL is: http://china-business-daily.blogspot.com/. It is a blog focus on global business news, especially Chinese. I think your blog (un-truth.com) is very professional, I like it. Do you have an interested in friendly link exchange? Please feed back to me. Thank you very much!